The modern American lifestyle is dependent upon trucks and the freight they carry. According to the American Trucking Associations, nearly 70% of the freight moved in the U.S. goes on trucks, with 9.2 billion tons of manufactured and retail goods transported annually. Each year, heavy-duty Class 8 commercial trucks and tractor-trailers log an estimated 99.2 billion miles. Keeping these large trucks and 18 wheelers in tip-top shape can be difficult and demanding. One challenge to their upkeep is the fact that they encounter every type of weather condition imaginable. For instance, trucks that traverse the northern part of the U.S. face extreme weather conditions, such as ice, hail and snow. The chemicals used to treat the highways can eventually lead to corrosion and wear and tear on the truck. 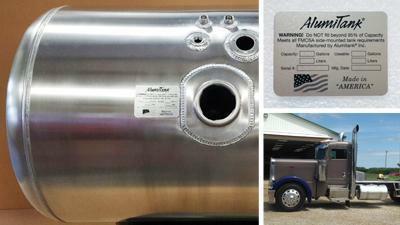 Among the many components that make up a truck, its diesel fuel tank is vulnerable to damage. The fuel tanks are generally mounted to the side of the truck and held in place by brackets and straps. Besides abuse from the elements, the fuel tank is susceptible to crashes and failure due to its design. It's a pricey item on a truck to replace, even more so if the trucker chooses to go back to the original equipment manufacturer. That fact has spurred the growth of AlumiTank, Inc., an aftermarket manufacturer of replacement custom aluminum diesel fuel tanks. The grass roots of AlumiTank were founded in the trucking industry in 1938 when the Kirkpatrick family formed a trucking business to deliver dairy cattle from the small, rural town of Harvard, Illinois, to the Chicago stockyards. In 1995, the company sold that business, changed its focus and name, and began selling replacement aluminum diesel fuel tanks to drivers of Peterbilts, Kenworths, Macks and other trucks. "MPC came here to look at the application and recommended a different pressure sensitive adhesive." For the last 21 years, AlumiTank has relied on Internet marketing and word-of-mouth to grow its business. Besides the inventory it keeps on hand for standard orders, the company makes custom diesel fuel tanks and tanks for specific applications, such as hydraulic and water. "We're about 70 people strong, and we build everything in Harvard," says Bob Kirkpatrick, co-owner of AlumiTank and a second-generation owner. "We use a 5000 series aluminum alloy that's manufactured in the United States for the tanks we build and sell." According to Kirkpatrick, the company's tanks meet the same safety regulations that the Federal Motor Carrier Safety Administration requires of all diesel fuel tanks. This means they pass spillage, leakage, mounting, impact survivability, weld requirements, venting and other safety standards before being sold. In order for truckers to know how much content the fuel tank can safely hold, a tag with that information is placed near the fill neck. A few years ago, the metal labels AlumiTank used began curling up on the tanks, which are cylindrical, rectangular or a hybrid of both in shape. "The data plates peeled back up and the adhesive wasn't adhering to the tank," Kirkpatrick says. "The label manufacturer gave us a deaf ear to our problem. "You have to listen to your customer's needs...that's what MPC did..."
"That's when I contacted Metalphoto of Cincinnati," he says. "MPC came here to look at the application and recommended a different pressure sensitive adhesive on the back of the Metalophoto anodized aluminum data plate. Now, MPC manufactures nameplates for us, some with empty data fields, and we finish them onsite using an engraver to mark the individual tank's number, date and gallon information onto the tag." Besides demonstrating proven outdoor durability, the nameplate holds up against the degreasing and washing done on the trucks. MPC's customer service and the fact that MPC products are American made were also selling points for Kirkpatrick. "In business today, it's not rocket science how to keep customers," he says. "You have to listen to your customer's needs and if you can fulfill his needs and solve his problem, he will come back again and again. That's what MPC did to earn and keep our business."